From left to right: Laura Patching, USCIS Office of Citizenship, Honoree Khadra Mohamed, President and CEO, Center for Somali Women’s Advancement, David Huerta, President, Service International Union-United Service Workers West, Wendy Kallergis, President and CEO, Greater Miami and the Beaches Hotel Association, Les Lak, Vice President Operation and Systems, Blasch Precision Ceramics, Teresita Wisell, Vice President and Dean of Continuing Education and Workforce Development, Westchester Community College. 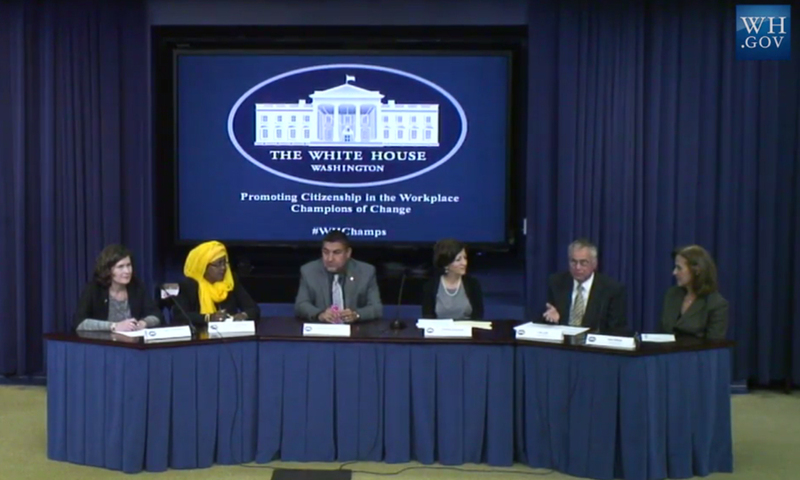 Blasch Precision Ceramics announces that Vice President of Operations and Systems Les Lak was among those honored by the White House as a “Champion of Change” Promoting Citizenship in the Workplace. Mr. Lak was chosen for his work in conjunction with the Literacy Volunteers of Rensselaer County to offer immigrant employees at Blasch a way to improve their English language skills while on the job. Not only do the employees taking part in these classes gain confidence, pride, and better communication skills, but six current employees of Blasch have also been able to achieve United States Citizenship due, in part, to their hard work in these classes.